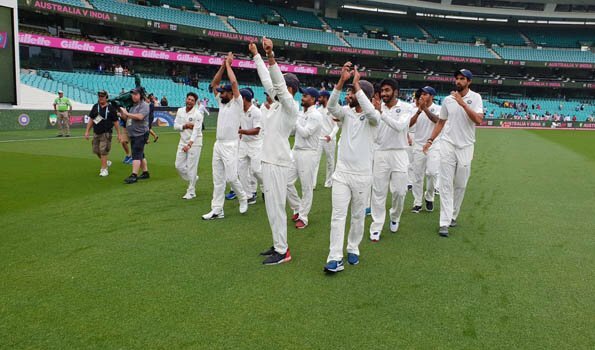 Sydney: India won their first-ever Test series Down Under as the final Test of the four-match series here at the Sydney Cricket Ground (SCG) ended in a draw on Monday. With this win, Virat Kohli-led side have become the first Asian team and the fifth overall to win a Test series on Australian soil.Having won the Tests at Adelaide oval and Melbourne Cricket Ground (MCG), the number one-ranked Indian Test side clinched the series 2-1. The final day of the fourth Test was completely washed out without a ball being bowled due to rain since the morning here. On the fourth day, the play was delayed due to rain with only 25.2 overs being bowled. The visitors bowled out the hosts for 300 runs and enforced the follow-on. Australia were forced to follow-on at home for the first time in 30 years. Australian openers came out to bat, but they could play only six overs scoring just 6 runs in their second innings as the field umpires signalled for an early Tea due to poor light. After that, match could not start due to insufficient light.They were still 316 runs behind to India's first innings total of 622 runs with all ten wickets in hand.